PARIS (Reuters) - A high-ranking French Catholic cleric, Cardinal Philippe Barbarin, was convicted on Thursday of failing to report allegations of sexual abuse in his diocese and said he would submit his resignation to Pope Francis. Barbarin denied concealing allegations that Father Bernard Preynat abused dozens of boys more than a decade before he arrived in the Lyon diocese in 2002. Preynat has admitted sexual abuse, according to his lawyer. There was no immediate word from the Vatican on whether Francis would accept the resignation, which could remove Barbarin from his post as archbishop but leave him with the rank of cardinal. Prosecutors in Lyon had previously investigated Barbarin but dropped the probe in mid-2016 without a detailed explanation. However, an association of alleged victims called Parole Liberee (Freed Word) used a provision of French law to compel the cardinal to stand trial. "This will send a strong message to the Church and to the pope," said abuse victim Francois Devaux, applauding the verdict. 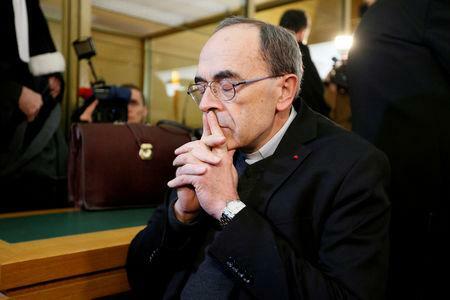 Barbarin's trial put Europe's senior clergy in the spotlight at a time when the pope is grappling with criticism over the Church's response to a sexual abuse crisis that has gravely damaged its standing around the globe. Francis ended a conference on clergy abuse of children last month with a call for an "all-out battle" against a crime that should be "erased from the face of the earth". Victims said the pope had merely repeated old promises and offered few new concrete proposals. Barbarin told the trial he only became aware of Preynat's abuses in 2014 after a conversation with one victim. Before that, he said, he had only heard rumors. He removed Preynat from his post a year later, when the allegations became public. The scandal is the subject of Francois Ozon's film "Grace A Dieu" (By The Grace Of God) which won the Silver Bear Grand Jury Prize at the Berlin International Film Festival last month.